An issue has arisen recently. It isn’t strictly a matter of censorship however it does involve a kind of restriction on broadcasting so I thought it was appropriate. Radio 4’s Thought For The Day program, which provides a platform for religious viewpoints whilst deliberately excluding atheistic or humanist viewpoints. There is an organised campaign of opposition here . It should be interesting to see what happens. The Controller of Radio 4 said that he hears no appetite for change, but with the exception of the recent Jonathan Ross incident, Aunty usually only receives 50-100 complaints a quarter. I've always enjoyed Thought for the Day ( TFTD ), that two-minute spot in the middle of Radio 4's Today programme, which seems to be a brief respite from the hard news, and a chance for someone to give moral or ethical reflections on current events. The trouble is that only religious speakers are invited. Rabbis, priests, imams, chaplains, and monks are there, but never humanists, agnostics, or atheists. Why not? Wouldn't it be better if they were? Morality is not the sole prerogative of the religious – there are even reasons to think that the irreligious are more moral. So why shouldn't we be invited to speak on TFTD ? I regard this as a genuinely difficult question. There may be a case for widening the pool of contributors on Thought for The Day by having someone with an avowedly non-religious perspective. However on balance the BBC's position is that it is reasonable to sustain the slot with believers. Let me now set out the reasoning. 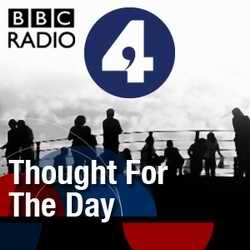 Thought for the Day is a unique slot in which speakers from a wide range of religious faiths reflect on an issue of the day from their faith perspective. In the midst of the three hour Today programme devoted to overwhelmingly secular concerns - national and international news and features, searching interviews etc - the slot offers a brief, uninterrupted interlude of spiritual reflection. We believe that broadening the brief would detract from the distinctiveness of the slot. Within Thought for the Day a careful balance is maintained of voices from different Christian denominations and other religions with significant membership in the UK. We are broadcasting to the general Radio 4 audience which regularly engages with the comments and ideas expressed by our contributors from the world's major faiths - whether they are believers or not. Outside Thought for the Day the BBC's religious output contains both religious and non-religious voices in programmes such as Sunday, Beyond Belief, Moral Maze. In these programmes atheists, humanists and secularists are regularly heard, the religious world is scrutinised, its leaders and proponents are questioned. Non-religious voices are also heard extensively across the general output in news, current affairs, documentaries, talks, science, history. These programmes approach the world from perspectives which are not religious. As, of course, do the other 2 hours 57 minutes of Today. The BBC should broadcast a version of Radio 4's Thought for the Day for non-believers, John Humphrys said yesterday. The Today programme presenter said that Radio 4 should create an alternative outlet for the irreligious, after the BBC's governing body ruled that excluding atheists from the three-minute religious slot did not fall foul of its impartiality regulations. Humphrys told The Times: As a non-believer, I've always thought there's an argument for a secular Thought for the Day — but not because of discrimination. I think we'd get some interesting views. Terry Sanderson, president of the society, claimed that allowing a religious monopoly gave speakers a platform on the news programme to put a biased point of view that no one can question them about . The trustees said that the necessary impartiality could be achieved by broadcasting alternative views within Thought For The Day within the week, or by the presenters referring listeners to other portions of the Today programme that dealt with conflicting views. Richard Tait, chairman of the Trust's Editorial Standards Committee, which considered the appeals, said: We understand that some people feel strongly about this issue and have given it careful consideration. However, we have concluded that the current arrangements do not breach BBC editorial guidelines and specifically requirements of due impartiality in content.